Home Posts Tagged "Skin Whitening Treatments"
Today, skin whitening treatments have become more popular than ever, as more people want to lighten their skin tone. Some people choose it to get rid of skin conditions or problematic complexions. While some opt for skin lightening to enhance their beauty and feel more confident about the way they look. The reasons for skin whitening by peel (chemical peeling) may vary, but almost everyone will discover the following benefits of skin whitening. Treating skin issues: Many people with complexion-related problems benefit from using skin whitening by peel. For instance, issues like uneven skin tone, hyper pigmentation, melasma and acne scars are treatable with chemical peel. Additionally, even if you have serious skin conditions, whitening products can significantly decrease the visibility of these conditions, and in some cases may help in fully eradicating them. Enhance your appeal: Although lighten skin doesn’t essentially mean more appealing personality, it is mainly about personal preferences for most people. Thus, if you personally don’t like your complexion, skin whitening by peel provides a solution of slowly lightening it to the tone that you would like. It is a myth that chemical peel is only for people with skin issues. Think of it like this: you wear makeup even if there are no blemishes to hide, which is exactly what you are getting with chemical peeling. Psychological advantages: When you have skin issues, like hyper pigmentation, acne scars and melasma, there is huge probability that they can actually affect you psychologically. And this is the reason why people develop low self-confidence and shy away from meeting new people. 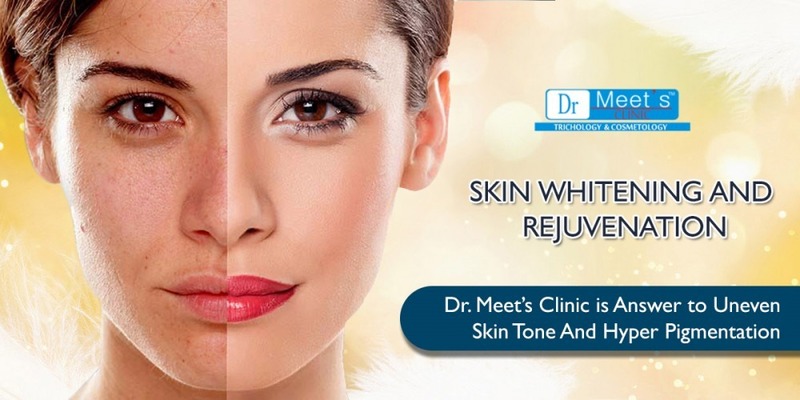 However, with skin whitening by peel, one can get rid of all the psychological issues related to skin problems by improving the skin tone in a short time. Many users who undergo whitening treatments feel an almost instant improvement in their self-esteem and confidence. Anti-aging benefits: Skin whitening products have a poor reputation of being harsh on the skin. But, when it comes to treatments like chemical peeling, they are not harsh and instead they help you look younger. Besides, the actual skin lightening benefit, you will also get a younger looking skin that is more lively, especially if you had age spots or blemish spots before starting the peel. Lastly, skin whitening treatment like chemical peeling is comparatively low maintenance. You just have to follow the instructions of your dermatologist for amazing results. To know more, feel free to contact us. Skin whitening, skin bleaching, and skin lightening refer to the technique of using chemical substances in an order to lighten skin tone or give an even skin complexion by reducing the concentration of melanin. An increasing number of people, across the globe, are using skin whitening products to lighten darker skin tone or reduce tan, fade scars and remove dark patches on the skin. Skin lightening treatment works by stopping the production of melanin in the skin. Darker skinned people have a higher concentration of melanin as compared to light-skinned people. There are a few chemicals that are known to prevent melanin productions, and during the skin lightening treatment, these chemicals are used. Professionals customize a skincare regimen to help decrease tan and visibly lighten your skin, leaving it glowing and fresh looking. Most popular skin whitening treatments include chemical peels. In this process fruit acids or other peeling agents are used. The process usually involves the application of a peeling gel to exfoliate the pigmented, darker skin. These facials fight discoloration and uneven skin tone with anti-oxidants. A tan refers to the skin darkening due to exposure to the UV radiation of the sun. Stimulation of the facial muscles assists with facial rejuvenation improves collagen growth and a radiant glow. A number of de-pigmentation and whitening agents are used like Arbutin. Arbutin is an extract of Bearberry plant and is very popular in Asian countries and Japan for skin de-pigmentation. In this technique, short concentrated pulsating beams of lights are directed as irregular skin, carefully removing skin layer by layer. This popular method is also called laser peel, lasabrasion, and laser vaporization. They are skin lightening lotions and creams that usually contain chemical agents like azelaic acid and hydroquinone. Some whitening creams have plant extracts that have bleaching effects. A dermatologist may prescribe a high concentration whitening cream. Each skin lightening treatment can be used for different skin problems. Gels and creams are usually for overall lightening effect, while laser treatments are usually used to reduce the appearance of dark spots. However, for best results, you must consult a dermatologist or cosmetologist who can prescribe the best treatment according to your skin. To make an appointment at Dr. Meet’s Clinic, feel free to contact us.